Well that was a long summer holiday with the kids! Over the holidays my subscribers to my YouTube channel hit over 1000! Thank you to everyone that has subscribed over the last year. Today as a thank you to you I have made a special project for you. 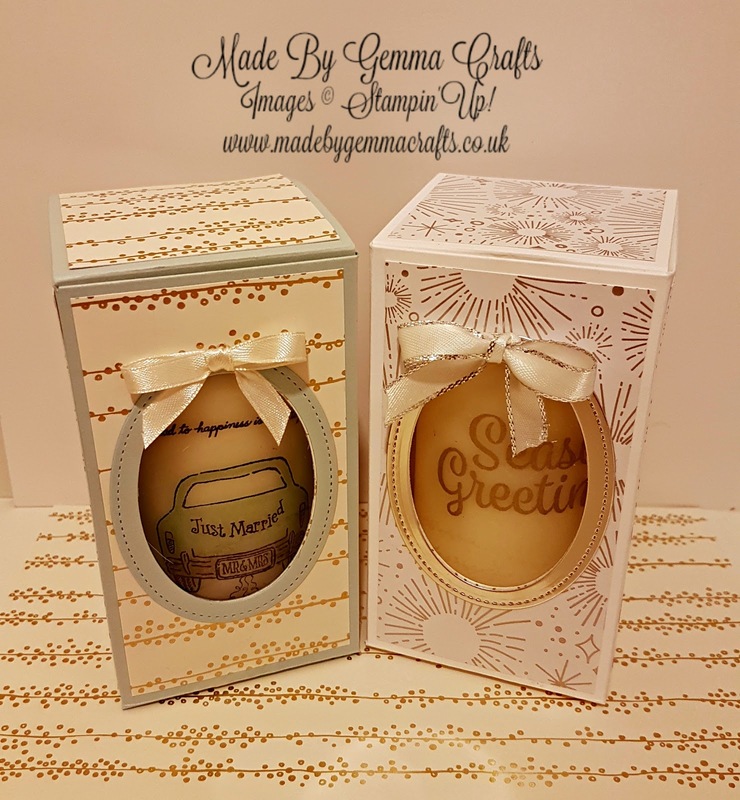 I have just discovered stamping onto candles and I have also designed a gift box for the candles. 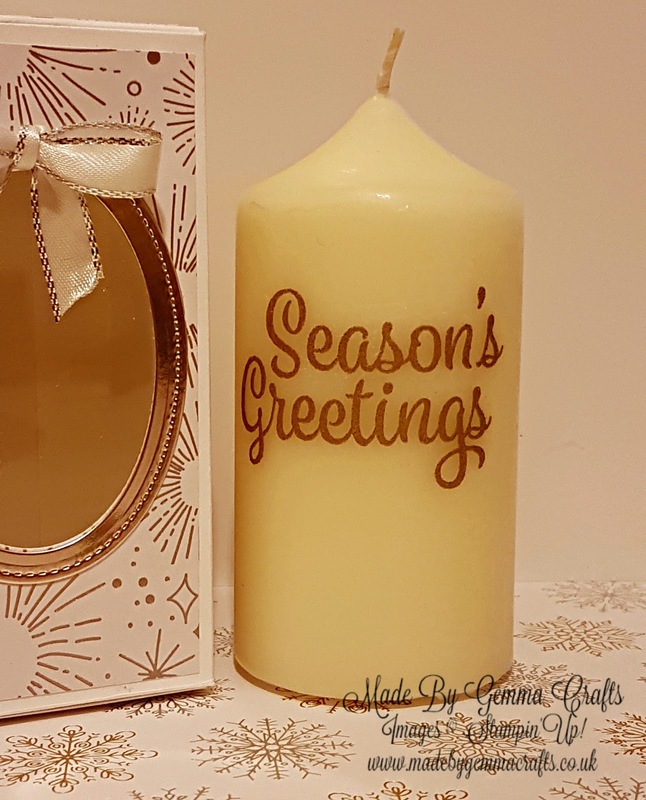 In November I have a stall booked at a local craft fair and I was thinking of different things to make and I have seen stamped candles a few times on pinterest etc and decided to give it a go. The candle below with the car on was the first one I attempted and I was really pleased with the results. 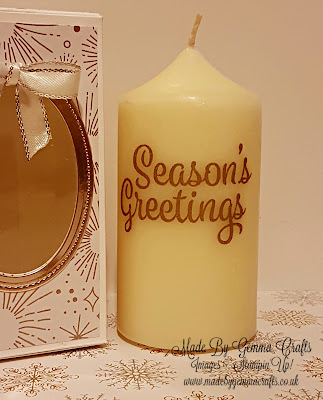 For the candle in the video tutorial I decided to try heat embossing on the tissue paper first before transferring to my candle, I had no ides if it would work or just be a sticky mess! As you will in the video it worked! 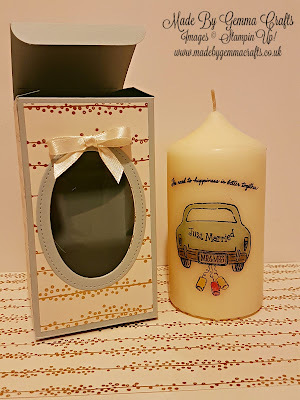 To add a stamped image onto a candle you will need a few things before you start. 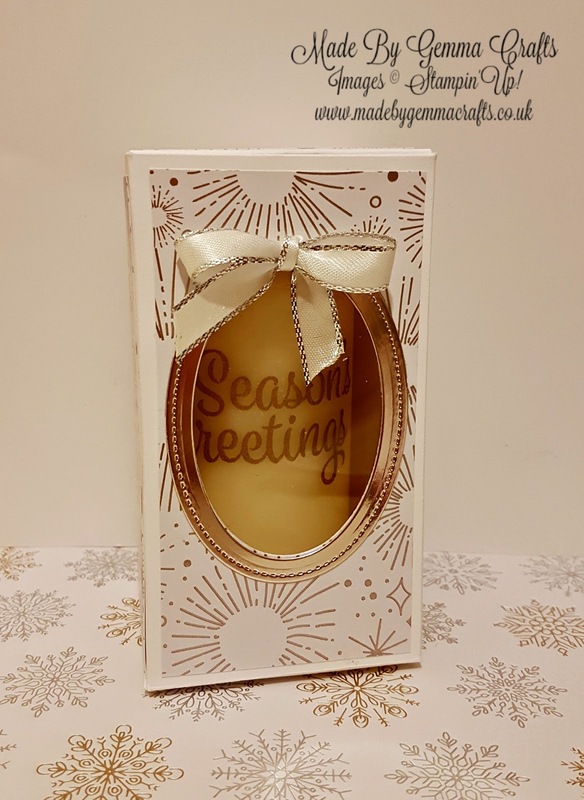 You will need some white tissue paper, greaseproof paper or wax paper, a heat gun just like you would use for heat embossing and most importantly a candle. My candle is from HomeBargains and cost 99p. The process is fairly simple you just need to remember not to concentrate the heat gun in one spot for too long or you will melt your candle completely! In today's tutorial I am using the new stamp set called Snowflake Sentiments and also the Speciality Designer Series Paper, Year of Cheer. This DSP is all foiled and so pretty. Paired with the Champagne Foils sheets it's just stunning! 1 sheet of A4 card, I used thick Whisper White. This needs to be scored on the long side at 2 3/4", 5 1/2", 8 1/4" and 11"
On the short side score at 2 3/4" and 7 3/4"
1 piece of card, also thick Whisper White, that measures 2 3/4" by 3 1/2" scored at 2 3/4" on the long side. 4 pieces of Designer Series Paper that measure 2 1/2" by 4 3/4" and 1 piece that measures 2 1/2" by 2 1/2". A piece of window sheet measuring 2 1/2" by 4"
A piece of Champagne Foil sheet to die cut 2 ovals from to make a frame. You will also need some layering dies, I have used the Stitched Shapes Framelit Dies ovals to cut the front of the box out and also a frame to go around it. What would the measurements be for the box in US terms.